Trailers are great accessories to haul your valuable items to any place because of their mobility. It’s also a great thing to leave them on the street or outside your garage because of the limited garage space However, it can become a heart-stopping moment when you realize that your trailer left without the best trailer hitch lock has been stolen. With the best trailer hitch lock, you can safeguard your trailer by deterring any opportunistic hauling by thieves. To make things easy for you, I have spent so much time searching for the best products on the market, so I compiled the top 5 hitch locks to review. 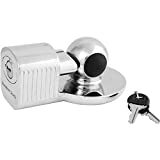 I know how financially stressful it could be to find out your trailer has been stolen; hence I devoted time on finding you the best trailer hitch lock. Below is a compilation of the best products on the market which I believe have suitable features to safeguard your trailer. These are the products from renowned auto-parts manufacturers. 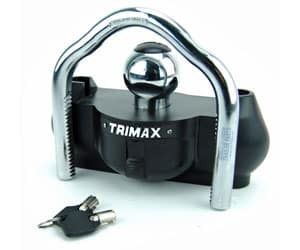 Appearing in heavy-duty, solid hardened steel, the Trimax trailer lock gives you a feeling that thieves will have a hard time trying to break it. The product is thick enough to deter any theft with the proper dual ratchet lock system. This lock system ensures a 360 degrees protection against any attempt to insert bars to break the lock. Worry not about the proper size as one size can fit all coupler types from 1-7/8”, 2” to 2-5/15”. Further assurance of security is given by its ballistic grade nylon which can absorb hammer blows. It also provides a good protection against the weather if you are accustomed to leaving the trailer outside. We know these tools can be exposed to harsh temperatures and then rust and that can compromise the durability if materials are of inferior quality. Even the key hole has been covered to protect against grime and dirt. To install this lock into your coupler is easy by just sliding the ball to the coupler and then putting the hardened 5/8” 16 mm steel shackle. Important: any trailer hitch lock can be broken if the thief has enough time on it. The main purpose is to deter opportunistic thieves. With this in mind, I reckon you add the Trimax chain just to enhance the security of your trailer. You have an option to even double the security by adding the Trimax coupler level lock. Even if you apply the hitch lock and leave the trailer unattended for quite a long time, a determined thief can maneuver ways to haul it. In that case, I recommend coupling this hitch lock with the Trimax TCL65 Wheel Chock Lock. It will clamp your wheels tightly with its thick, heavy-duty steel. 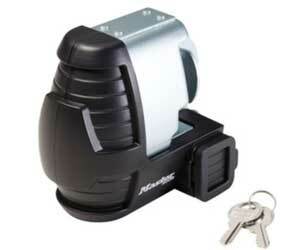 Using this trailer lock can heighten the security of your trailer lock. The company offers a lifetime warranty on its products, which means you are safe to return a faulty product for repair. With amount of time given, it can be broken with a sledge hammer. That’s why I recommend adding other protection measures such as the wheel clamper and the Trimax chains. 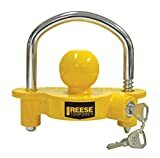 Given the design and durability of this trailer hitch lock, I do recommend it to anyone looking for an optimal security. The U-shackle is heavy-duty and the ratchet lock system is also a guarantee that your trailer will be safe. The 360 degrees safety ensures that no easy way of inserting bars to break the lock. However, if you are leaving the trailer outside for a long time, I recommend adding additional protection by clamping wheels. The name “Master Lock” is synonymous with security systems the world over. 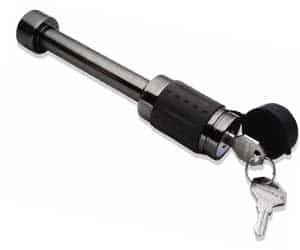 The company has manufactured this indispensable trailer lock for trailer owners. It comes as a combo for the trailer coupler and receiver lock charged at an affordable rate. 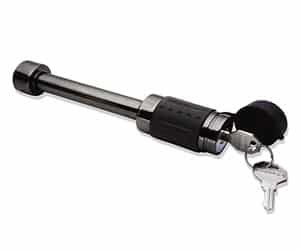 Master Lock trailer lock can be used on vehicles, trailers and RV hitch locks. You can rest assured this stainless steel lock will be applicable on your couplers with specifications 1-7/8-in, 2-in and 2-5/16-inches. This combo comes with the coupler lock, receiver lock, latch lock and 2 keys which can open all three locks. Thanks to the Auto Lock and the Release Mechanism for making this trailer lock an absolute breeze to use for your trailers. To lock the trailer, simply turn the key about ¼ and the lock will automatically be released form the pin. Then remove the key and push the pin to completely lock the hitch. 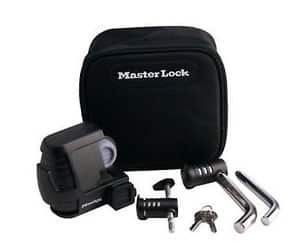 What has also caught my eyes with this Master lock is its durable design. It is a watertight, laminated steel construction to ensure maximum protection against any downpour or dirt. This also ensures that it is protected against rust. Its stainless steel locking head swivels also play a part with the rubber cover to protect against any rust. There is no difficulty in installing or removing this hitch lock. To other locks you can spend more time trying to figure out how to install it or unlock. When installing this lock, bear in mind it fits the couplers of sizes 1-7/8”, 2” and 2-5/16” regardless of which manufacturer provided them. By using this hitch lock you can minimize the common thefts of trailers if you are accustomed to leaving them outside. On the issue of durability, note that a dedicated thief, given enough time, can break open the lock. It’s advisable to also put additional measures in place like the wheel clamp so that thieves do not tamper with your property that easily. 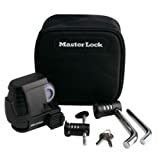 The name Master Lock impresses me with security locks. I do recommend this combo of latch lock, receiver lock, coupler lock and 2 keys. It’s an affordable solution for trailer owners looking forward to safeguarding their trailers. However, note that the lock can deter criminals for that time. I therefore advise you to always leave the trailer in public spaces. Consider the wheel clamp as well. Nonetheless, the lock is still a great deal. Connor trailer hitch lock is also a respectful name in the industry with its enhanced protection of trailers left unattended. It fits Class III, IV and V hitches with receivers of 5/8 inches. With this trailer hitch lock in your fingertips, you can minimize stress of trailer hitch by securing your hard-earned cash. The lock has a great strength with a patented design that has been engineered to last for many years. Because trailers are often left outside, the outdoor elements can expose the lock to rust and corrosion. Heavy duty metal construction is an added advantage as it will protect against harsh elements. A durable black nickel finish has been employed in enhancing the dependable strength of this trailer hitch lock. To make things even easier the lock features the auto lock and release mechanism, meaning it is a cinch to lock it. It helps you to remove the key after unlocking or locking the lock. When locking it, simply turn the key about ¼ until a click sound. The lock will automatically release the pin. It actually minimizes the hassle and frustration because some locks are void of this feature. If you are worried about treacherous weather conditions, the lock features an all-weather rubber cap. It enhances protection against grime and corrosion to ensure that the lock lasts long. Combined with a durable design, you can spend many years without replacing the lock on account of a deteriorating quality. Connor has placed a high quality and value in the product. However, in spite of having a durable design, I do not guarantee you that it can endure the sledge hammer blow for a serious thief. Just to stay on the safe side, I recommend additional measures of protection; perhaps the wheel clamp or tracker. My take is that this hitch lock is a portable lock with a unique durable design. It deviates from the customer U-shaped shackle locks. What I also adore with this design is the auto-lock and release mechanism which eliminate the installation frustrations. I recommend the product to safeguard your trailers. Its all-weather rubber cap ensures that it withstands the extreme weather conditions. 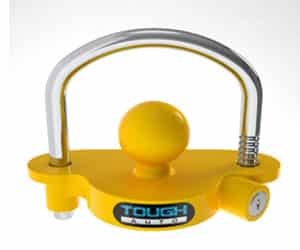 The Tough Auto trailer hitch lock embraces the steel and aluminum combination to safeguard your trailer. You can choose from red, blue and yellow color variants with a silver U-shaped shackle that is corrosion resistant. The components of the lock are all corrosion and rust resistant. The lock is the universal version – meaning it can fit a wide variety of hitches up to 2-inches, thanks to its adjustable setting. Oftentimes we buy locks and realize we bought wrong sizes. That is not the case with universal trailer hitch locks. Design-wise, the product was carefully designed to resist theft and drill outs. It is durable, so it will last for a long time thanks to its heavy duty construction. The steel is naturally stronger and aluminum is also stronger following steel and also light. Handling the lock is not a challenge because of this composite of materials. It contains rigid A36 steel finished with chrome. The locking pins are made with steel and the base with aluminum and coated with powder. All these measures prevent corrosion. It is easy to install this hitch lock. Just mount and lock onto the trailer hitch ball. Meanwhile a coupler latch lock may be suitable if you want to lock the trailer while on the vehicle as this lock only works if off the vehicle. It is ideal for those leave trailers unattended. The security of your trailer will be enhanced by this trailer hitch lock. In case you lose your keys, you can contact the manufacturer anytime for replacement keys. However, just like other hitch locks, I like recommending additional measures in place as any lock can be broken with heavy tools. If you leave your trailer unattended for a long time, you may need the wheel clamps in addition to the cameras and chains to safeguard it. Given more time, a thief can eventually manage to break the hitch lock. The other tip is to store the trailer in public spaces where a thief can be discouraged to fiddle around with the trailer lock. There are just many reasons why this trailer hitch lock is good. Firstly, it is portable – made of steel and aluminum metals. This helps in protecting against the rust and corrosion. Secondly, it’s easy to install it by just mounting and locking onto the trailer hitch ball and then locking the shackle. The steel locking pins enhance the security of your trailer. And the other added advantage is the universal lock which means it can be adjusted to a variety of sizes up to 2-inches. It is the best product money can buy. I am wrapping up my compilation with the Tow Ready Gorilla Guard Coupler lock which I found quite interesting too. It is printed a gorilla and the 2” on the design as a trademark. Moreover, it is a patent of the US. With this coupler lock, you can safeguard your unattended trailers. It easily fits into the ball socket of the trailer and gets wrapped with the solid steel bar. The thickness of the lock can potentially deter lots of opportunistic thieves. It has a 360 degrees protection; meaning is not easy for the thief to find the spot where he can insert a bar to break open the lock. All these design configurations reassures maximum protection. Two keys are included for a hassle-free locking of the coupler lock. The company reassures you a quality product and gives a 1 year warranty. Corrosion and rust are accounted for with the properly designed and thick steel. This means it will last for a long time regardless of how extreme weather conditions are. While it looks so thick on the picture, it is still a reasonably lighter coupler lock you can handle with ease. If the thief were to hit the lock with the hammer, you can catch him before he finishes. Compared with the preceding product I reviewed above, this coupler lock is relatively tough. It’s made with a durable heavy-duty steel construction. It can take a long time before an intruder breaks it open with a heavy-duty tool. On overall, this coupler lock is a good and affordable product for 2” couplers. Its quality resonates with its naming “gorilla guard’. It can be the best solution to safeguard your unattended trailers without opportunistic thieves taking chances on it. It’s only serious thieves with heavy tools and enough time that can eventually break the lock. But that’s unlikely to happen of course. I liked the design of this lock. It is rust and corrosion proof. This reassures me that it can last for a long time amid the inclement temperatures. What is a trailer coupler lock? What is a locking hitch pin? Which one is the most secure coupler lock? Now let’s delve into the buyer’s guide to help you narrow your search. With a plethora of trailer hitch lock abundant in the market, it is not that easy to choose the best right away. You need to a few aspects first. This need has propelled me to compile this buyer’s guide for you. 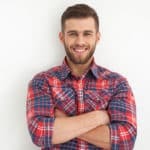 I will look into the basic definitions of a few terms and the important features you need to know before making purchases. 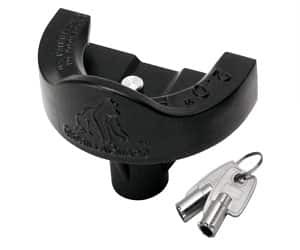 A trailer coupler lock is the tool used to lock the coupler into place to deter any criminal activity on your trailer. Trailers are bought at higher prices and they are very mobile to be attached on vehicles. As thus, they get stolen so easily and without the proper coupler lock you may find it stolen in a blink of an eye. A coupler lock is key operated and comes in different designs as evident in my aforementioned products. Some come as the base and the shackle, whereas others, like the gorilla guard above, come in unique designs. Still on that, others are made with different materials such as aluminum, steel, chrome finish and titanium. But still is the most prevalent metal used because of its toughness and resistance to corrosion and rust. Aluminum is a light metal, so its composite can be added to make the product lighter. The coupler locks come also in different sizes. Some fit 2” and others fit over that. You will be fortunate if you found a universal lock that can be adjusted per the hitch. That will save you frustrations and money. With the coupler lock you can protect lots of valuables from trailers to boats, and campers. The locking mechanism is also different from one lock to the other. A locking hitch pin is a locking mechanism that is used to secure the trailers. The pin comes in different sizes for specific hitches. For instance, for Class III trailer hitch with a 2” receiver, a relevant hitch pin is the one with a diameter of 5/8”. The thicker the diameter of the pin is the more security to your trailer. The hitch pin and the hitch lock are not the same, although their main purpose is to secure the trailers. These coupler locks I reviewed above differ in quality and specifications. A secure coupler lock is the one that can survive all the abuse such as hammer blows. However, this is dependent on the type of material use. But still is a prominent metal that guarantees security. Some coupler locks can be destructed in a few minutes, whereas others can give thieves a tough game. Practically, any coupler lock can be broken, but depends after how many minutes. Given the whole day or night, a thief can break any coupler lock. Nonetheless, I reckon you consider the material and the design. From my products above, I recommend the last product; that is the gorilla guard lock. It has a thick steel construction which guarantees security. But I have to admit that it is difficult to have an obvious winner. Take into account the locking mechanism. 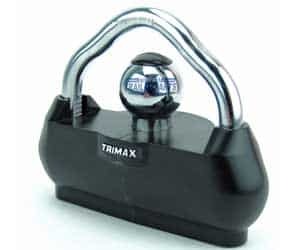 Then you might end up siding with the Trimax for its dual ratchet locking system as it also offers a sense of optimal security. Choosing the correct size of the trailer coupler lock should be an absolute breeze because you pick based on the ball diameter of your trailer. A smaller coupler lock versus a bigger ball diameter will not fit, and a bigger coupler lock versus a small diameter will loosen the lock. This could make it easy for thieves to insert tools to break the lock. So, when choosing, a 2-inch diameter should go with the 2-inch coupler lock and a 2-5/16” with a 2-5/16-inch coupler lock. But, as you choose, note that some universal locks can actually adjust to any size. It’s advisable to consider this kind of lock if you are unsure about the exact diameter of your hitch ball. Otherwise consult your trailer manual to see the exact specifications. These are the important factors to consider before making any purchase. Failure to consider the features may lead to a purchase of inferior products. These features are numerous, but let’s consider the durability, design, and ease of use, and the pricing. Durability is an important factor when buying the coupler locks. The main objective of having the lock is to enhance the security of your trailer. This means durability should be prioritized. Apart from being tampered with, it can be exposed to outdoor elements that could jeopardize its quality. Durability of the coupler lock is reflected by the type of materials being used. Among others, steel and titanium are the strongest metals that are used, but steel is prevalently and predominantly used due to affordability. Aluminum metal is also used but rarely used alone because its strength is not comparable to that of the steel. Among my products above, there is a composite of aluminum and steel, with aluminum at the base and steel at the locking mechanism. Chances are, thieves will not be lenient when tampering with your coupler lock. That means you need a durable metal that cannot be broken with ease. The coating is also important to assess the rust and corrosion resistance of the lock. The ease is also an important consideration when buying the coupler lock. This ease of use can be measured by the ease of installation, locking and unlocking. Some have poor locking mechanisms which can be difficult to use. The gorilla guard above, for instance, it can be challenging to insert the key. However, it is a great product worth having provided you can maneuver your way around the key use. If the locking mechanism is not ease to use, you might end up breaking it when you try to figure it out. It is important to assess this feature whenever buying the hitch locks. Others have the auto-lock and release mechanism, while some you need to lock without the keys, etc. Such are good considerations to eliminate the hassle and frustration. The design of the coupler lock is important too. It is not about an aesthetic look and a functionality of the design. If poorly designed, the thieves can manage to insert some tools to break open the lock with ease. You need a design that has a 360 degrees protection. I think the size of the lock also plays a part in this. For instance, if the lock is too bigger than the diameter of the hitch ball, it can be to insert a sharp tool and break the lock. From my products above, you will notice that there are varying designs. Look at the gorilla guard and the Connor trailer hitch lock; they have different designs from the popular U-shackles. Nonetheless, the design alone is hard to figure out if it guarantees the security of the lock. Also noteworthy to the design is the type of trailer tongue you have. This can be an A-frame, gooseneck or a straight tongue, and it helps in determining the design of the trailer hitch lock. A perfect fit is paramount. Pricing is just an additional factor but not really of paramount importance as it can be deceptive sometimes. You should typically consider the price of the hitch lock after assessing the aforementioned indispensable features before buying. But, in some cases, higher prices reflect a great quality. If titanium metal is to be used in a lock, the lock can be more expensive because it is relatively stronger. Aluminum is the least expensive and the least strong metal compared to titanium and steel. Investing in expensive coupler locks can be a good thing for highly priced trailers. This shows how much you value the price of the trailer. As much as I value the security and importance of trailer hitch locks, I admit that they cannot protect the trailer 100%. These products are probably the best you leave the trailer for a few moments, not when you leave it unattended for the entire night or day, unless is in the public space. Even the toughest lock can be broken when the thieves have enough time. This security shortfall necessitates for the inclusion of additional security measures to ensure that your trailer is secured. These include the camera, trackers, and wheel clamps. The wheel clamps/locks can help combat crime to a higher level. Criminals can maneuver a way around your coupler lock and manage to grab the trailer. If the wheels are locked, then that’s another frustration to the criminal and the likelihood that he will leave it. 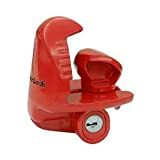 There are wheel clamps such as the Heavy Duty Automotive Anti-Theft Wheel Clamp which is a heavy-duty tool to clamp a wide variety of wheels. Combining it with the coupler lock can heighten your trailer security. 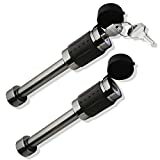 The COOCHEER Car Wheel Lock, Anti-Theft Tire Lock Clamp is also worth considering locking your wheels. Surely by now every vehicle owners know about the benefits of GPS tracking for the cars. The same technology can be installed on the trailers to help locate them if they got stolen. Fortunately, not everyone considers the presence of a GPS tracking device on the trailers, so it’s easy to hide it and then track your valued trailer with ease. This is an indispensable technology to consider if you leave your trailer unattended to for quite a long time. I have come to the end of my reviews of the best trailer hitch lock on the market. Throughout the journey I reviewed each product in details and highlighted my verdict. It’s evident that without the hitch locks; your trailers are not safe at all. It takes only a few minutes for an opportunistic to haul your trailer. With the coupler lock the thieved can be deterred. I presented the buyer’s guide which I compiled to help you make the right decision of buying the trailer hitch lock. I have also recommended additional security measures because the coupler alone is insufficient for trailers that are left unattended for a long time. Enjoy your shopping and always take into account the important features discussed in the buyer’s guide. Do not be deceived by prices. Durability, design, ease of use, and the materials used are important factors to consider.